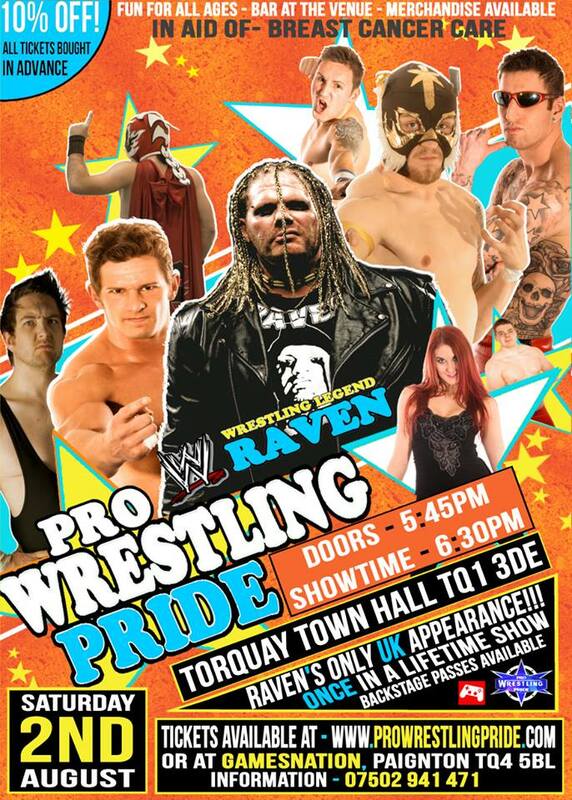 Pro Wrestling pride is bringing it's own unique brand of adrenaline fuelled family friendly entertainment to Torquay Town Hall: and this time they're bringing with them RAVEN! Raven has appeared all over the world for WWE, WCW, ECW, TNA, ROH & more... now he will be joining the superstars of Pro Wrestling Pride live for one night only at Torquay Town Hall Saturday August 2nd. RAVEN will not be appearing for any other company during his time in the UK and has informed us that this may be his very last tour of the country! So for all you fans out there this really is a once in a lifetime event you cannot miss. Champion Danny Walsh vs PJ JONES! Other superstars set to appear: Ultimo Tiger, UK Dominator, Tyler Hawke, Darren Saviour, Mark Walsh, Josh Knott, Rob Britannia + Many More!! Alongside this Raven will also be doing an exclusive Q&A session where he will answer all your questions about his career, the WWE and life as a superstar pro wrestler! The Q&A will take place at 3pm on the day. There will also be an exclusive Backstage meet and greet directly after the show. They are already selling fast so be sure to grab yours now before they are all gone! RAVEN is coming to the UK to FIGHT!!! Torquay, Sat - August 2nd! Video of RAVEN is coming to the UK to FIGHT!!! Torquay, Sat - August 2nd!